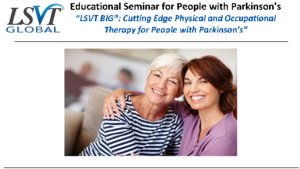 LSVT Global invites you to a free, one-hour presentation on the effective, evidence- based LSVT BIG treatment program on April 28, 2019. Please wear comfortable clothing and shoes to the event. People with PD, family members, friends, caregivers, and other health care professionals are all welcome to attend the presentation!